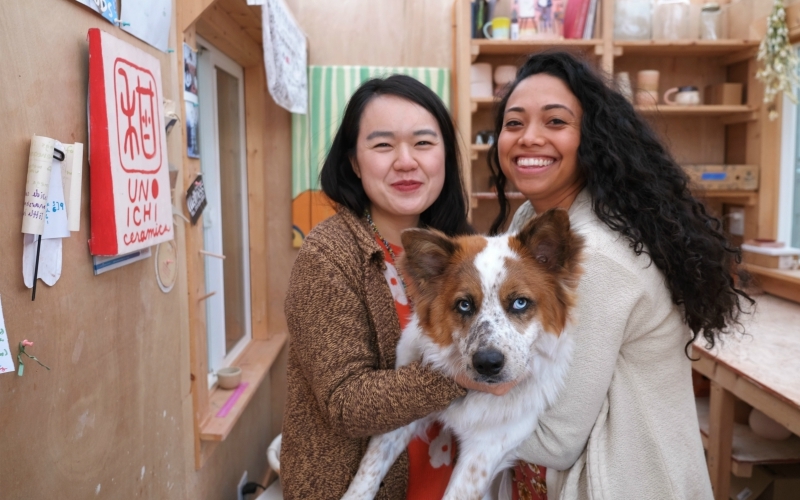 Even if you haven’t heard of Uno+Ichi, you’ve probably seen their ceramics around town or at least happened across one of their irresistibly adorable Instagram posts. Their whimsical vessels—planters, mugs, etc.—are emblazoned with stoic little faces. Women with Kahlo-esque unibrows or glasses propped on their tiny noses stare out at their surroundings—not judging, necessarily, but observing. Each piece is as unique as the duo that collaborates to create it. Sitting outside their West Adams studio on a recent Sunday afternoon, Hana Ward and Joanna Lee almost match. Lee wears a bright orange floral top with flowers and Ward wears a similar floral dress. Lee often tosses her head back when she laughs; Ward’s energy is slightly more subdued, but she smiles widely when remembering their brand’s beginnings. The two met at Brown University and eventually crossed paths again in Los Angeles. At first, they worked in Ward’s father’s backyard—where there current studio stands—without a shelter. On cold days, they wore jackets and sat at the pottery wheel with every part of their bodies covered except for their hands. In 2016, they bought their first kiln, and soon after that, they built the small studio with help from Ward’s dad. The Uno+Ichi name comes from 1+1: “uno” meaning one in Spanish and “ichi” meaning one in Japanese. Each of their works comes stamped with the Chinese character 和, which can also mean “and.” It’s a confluence of influences that the two see as a spot-on reflection of L.A. culture. Besides getting their brand’s name out through pop-ups and craft markets, the duo often walked into spaces they admired and made their sales pitch to anyone who would listen. Friends also helped get the word out, coming back to let them know they gushed about Uno+Ichi to a local boutique. Sometimes, Ward and Lee would sneak their pieces onto the shelves of stores they loved and snap photos on the sly; if the store responded saying they wanted to carry their pieces, they had photos ready to share. The first space to carry their pieces was Design Café Dabang, not too far from their studio. The two no longer go door to door to hawk their wares. Many stores reach out to them now, and their pieces are in shops across the U.S. and even in New Zealand. Their pieces come with playful names like the “Unibrow Niñas” (the aforementioned Kahlo-looking ladies), the “Ring Holder Ladies,” “Crybaby Tumblers” (closed-eye faces with little tears), “Toast Man,” and more. For Valentine’s Day, the duo is offering custom-made “Niñas y Chicos.” You can choose the characteristics that make up each stackable cup: skin tone, hair color, glasses, you name it. Next, the two are exploring the idea of creating even larger pieces and seeing what the brand looks like “outside of ceramics,” as Lee puts it. If you want to learn how to make your own adorable ceramic pieces, Ward will be leading a workshop on May 3 at the Craft and Folk Art Museum.